The ovaries are part of the female reproductive system. They produce a woman's eggs and make female hormones. 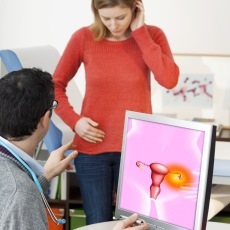 Ovarian cysts are fluid-filled sacs in or on an ovary. They usually form during ovulation, when the ovary releases an egg. They are usually harmless and go away by themselves. Most women have them sometime during their lives. If your health care provider finds a cyst, you may be able to wait to see if it gets bigger. You may need surgery if you have pain, are past menopause, or if the cyst does not go away. If a cyst bursts or causes bleeding, you should get medical help right away. Birth control pills can help prevent new cysts. Rarely, ovarian cysts can become cancerous. This risk increases as you get older. A health problem that involves ovarian cysts is polycystic ovary syndrome (PCOS). Women with PCOS can have high levels of male hormones, irregular or no periods, and small ovarian cysts. Article: Hemoperitoneum in a Peritoneal Dialysis Patient: Ruptured Ectopic Pregnancy.